It is literally impossible/illegal to stay in Queenstown and avoid doing some outdoor crazy pursuit. So we signed up for a skydive. I had done a bungy jump in Switzerland many years before and had found that enjoyable but scary and was in no rush to repeat it. I was mildly apprehensive about the sky dive. As it turns out, it's a totally different kettle of fish. 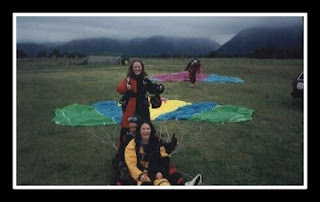 We did tandem jumps where the instructor is strapped to you (no WAY was I doing a solo jump). The jump is a very calm exhilarating feeling (hhmm, is it possible to be calm and exhilarated at the same time?!). They fly you to something like 15,000 feet, you scoot over to the open door of the plane, and you just lean forward. The freefall is the exhilarating bit, when the parachute is opened that's when calmness descends and you'll never want to come back to earth. Christchurch really reminded me of England. Stone churchyards, English country gardens, Miss Marple booting around town on her penny farthing. It's actually the main place I want to come back to in NZ and explore more thoroughly. I am a sucker for quaint places/people. In fact I secretly want to be Jessica Fletcher in Murder She Wrote, knocking out books, cycling my bike around Cabot Cove, solving murders by pointing out the bleedin obvious. Perfect life. Kaikoura is a pretty sea side town. If you want to do any type of water based activity, this is the spot to do it in. Picton, the clue is in the name, it is very picturesque, white picket fences, picture perfect picnic scenery, and other 'pic' words. Also, its only a ferry ride from Nelson in the North Island. If you had to choose between the north island and south island, the North Island has a lot to offer but if you only have time to visit one, everyone knows the South Island is where it's at.